The highly specific title of this production is just another way for UK theatre company Ridiculusmus to play with their audience. What is being explored goes way beyond schizophrenia, and the relevance is not restricted to Western Lapland, unless we are all somehow Scandinavian. Eradication shows our tendency to categorise all kinds of personal and interpersonal difficulties; ailments any of us might face at some time in our lives. It persuades us to consider whether the medical terms and the pharmaceuticals that we throw at these difficulties only make matters worse. However, there is no preaching; we come to these thoughts mostly through our own observation. What they have us observe confirms Ridiculusmus as true masters of theatrical method. The stage is split in two by a wall. One side of the wall is a dysfunctional home, the other a dysfunctional institution. The audience are also split into two. Each can only fully see and hear one of these worlds, but can hear much of what is happening in the other. At half time, we swap sides; and so by the night’s end we have all seen the entire game played out. At times the wall appears to be a border between these two worlds, at other times it appears more like a gateway. Ridiculusmus keeps you guessing throughout. Is one world imagined, the other real? Perhaps one past, the other present? The storyline makes an odd kind of sense, but with a palatable incoherence which leaves you sympathising with anyone who suffers from delusions. Importantly, the players never abandon the audience or stray into self-indulgence. The work of David Woods and Jon Haynes shows twenty years of anarchic playwriting. They know how to break shackles without breaking audiences. 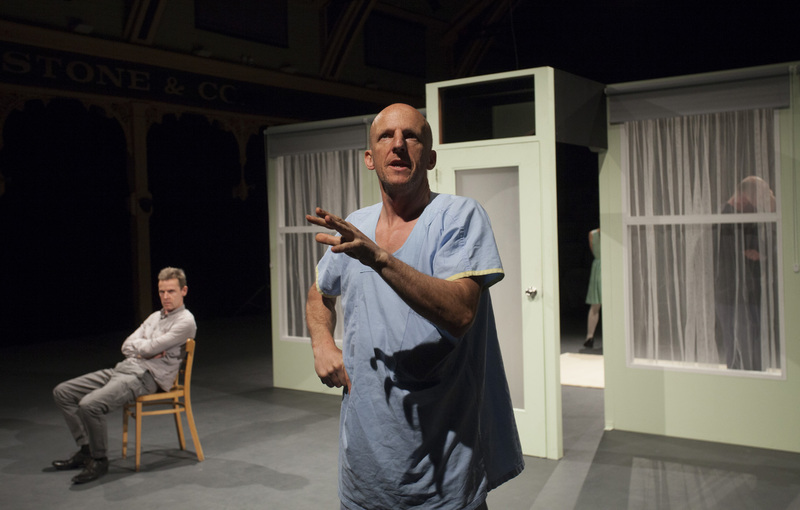 As Therapist and Patient respectively, Woods and Haynes play their own work with distinction. As both writers and performers, they give their fellow players plenty of opportunity to deliver. As the patient’s brother, Ben Grant was heartbreakingly defenceless as an adolescent exposed to emotional abuse. As the narcissistic mother, Nicola Gunn deftly exposes the kind of splintering of the soul that would drive a parent to splinter their family. Dates: Wed 12th to Sunday 16th November. Time: Wed – Fri 7.30pm; Sat 2pm & 7.30pm; Sun 5pm. Location: Arts House, Meat Market, 5 Blackwood St, North Melbourne. Tickets: $26 Full, $21 Concession. Bookings: www.melbourne.vic.gov.au/ARTSHOUSE/PROGRAM/Pages/TheEradicationofSchizophrenia.aspx, or call (03) 9322 3713. Warning: This show is restricted to those aged 14 years and older.